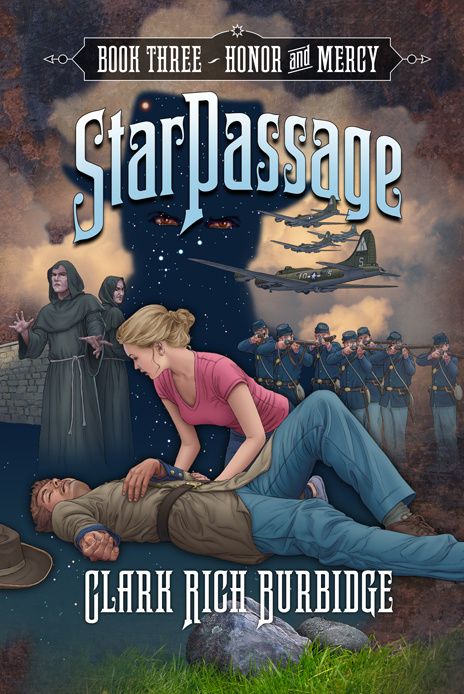 StarPassage Book Three: Honor & Mercy is a riveting continuation of my triple Gold Medal award winning series. The intensity of the story ratchets up as the Trackers bring the battle for earthly souls to the Present Time. There is no safe space for the Carson's and the growing group of heroes as they face the apocalyptic implications. The possibility of a betrayal exists and the challenge of trying to resist the Tracker’s plans when you can't see them makes the suspense almost unbearable. Certainly new and even more dangerous passages are involved. Their triple quest to unravel the relic’s riddles and combat the Tracker threat while dealing with their own personal challenges transport our heroes into desperate historical moments. New friends and old enemies add to the story in unexpected ways. It was a wild ride to write and I expect it will be every bit as exciting to read. Yes, I appreciate different perspectives on my books. I encourage young readers to send me their reviews and publish excerpts on my website minus any spoilers of course. I haven’t had any bad reviews although there have been a couple that I felt didn’t really get the book they were reviewing. I will often respond to reviewers and thank them for their insight. I especially enjoy those from my target markets youth, their parents, librarians and teachers. As an author editing and critical reviews are part of life. They almost always improve the story and help me become a better writer. Write. Have your writing edited and apply the lessons you learn from it. 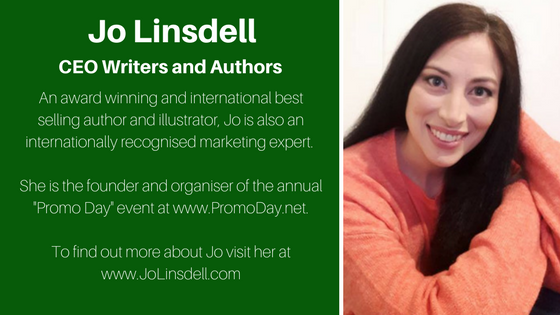 A good editor may suggest lots of changes, some may be difficult to address but they will make the manuscript better in the long run as long as the editor does not try to change your voice. Always remember it is your work and your voice at the end of the day. See. As you walk through life see the world through different eyes. Any moment can bring a unique insight or new way of seeing something others view as mundane. A simple star sitting atop a Christmas tree began a thought in my mind that has now become three Gold Medal winning books. As you stretch yourself to see new horizons, new possibilities and the beautiful magic that is in the world all around everything becomes possible. Give Back. There will be many opportunities along your path to uplift others and be generous. Take the time to give back and make it part of your outreach to the world. I have done this through my “Live with the Heart of a Giant” Tour to schools, communities and faith based groups. It has inspired young people all over our country to believe in themselves, that they can overcome the challenges they face, that they are good enough to do hard things, that they have the ability to make a difference and that they are never alone. We live in a connected world and I have a fairly unique name so I am easy to find. 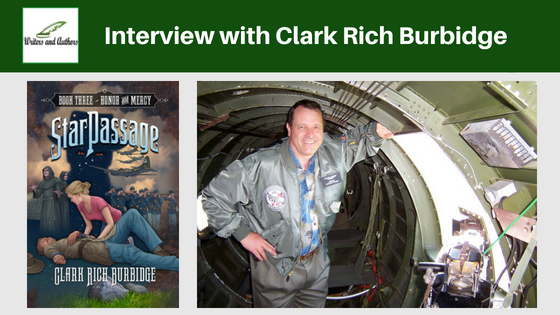 You may like or follow me on www.facebook.com/clarkrburbidge to keep up with what is going on. In addition, my book websites: www.giantsinthelandbook.com, www.starpassagebook.com and www.apieceofsilver.com provide additional background on my books, me and my event tours. Of course the best way is to spend time together is to invite me to your school, church or community groups and we will have an awesome time together that you will not soon forget. Also, my books are available in many bookstores and online at Amazon, Barnes & Noble and Indiebound as well as with my publisher DeepRiver Books. Reading an author’s books tells you much about who the author really is. Because I have walked the adventure myself. I don’t write from an outline per se. I experience the story with the characters and often have no idea what is going to happen next. Suddenly I find myself with the characters in an unexpected period of history and I need to research it to learn what will happen next. New characters, enemies or dangers may appear suddenly and I have to deal with them along with the characters. This means when I am writing it is an exciting experience as if I am in the book. It also means that I can perfectly relate to how the reader will react when they read it for the first time. It is a tremendously exciting way to write and it means that when I have to stop to eat or sleep that I can’t wait to get back to find what will happen next. My readers tell me they have the same experience when they climb into the book with my characters and begin their adventure together. Real reading isn’t just for comprehension. When a young person becomes part of the book, as they can with mine, and walks the path with the characters they discover that good stories and well developed characters have the power to transport them into Passages of their own. I love writing for and inspiring any age. But writing for young people who are still forming their opinions and perceptions is a powerful responsibility that I embrace fully. This allows my writing to help them see new possibilities and explore parts of their mind that they might not otherwise discover. I hope my writing also helps them see potential, hope and purpose in their lives that the world doesn't seem to encourage much anymore. Our young people can make a difference, they are not invisible or unimportant. They need to pursue their dreams and expand their understandings and not follow the narrow, mind-numbing stereotypes that society would teach them through pop culture. Youth need to be encouraged to see with their own eyes and learn about the great sacrifices others have made to create and preserve the freedoms we enjoy rather than blindly fighting against our divinely inspired country. There is so much to learn and see that they will never experience by following those who would teach them to be blind and deaf. Karl C. Hepworth is a wonderful talent and has designed the cover and inside art for my last six books. His background includes Marvel Comics and Disney and his approach is meticulous and detailed. We have used human models for many of the characters he has drawn and he thoroughly reads the books and historical time periods to get even the smallest details correct. His work is like magic to me as it appears on the page. It is not so much that he is creating the art as it is that he is uncovering the art that was already there waiting for the right hands. He has also added much to the stories through his edits and questioning regarding specific scenes that have allowed me to get the details right. Writing my StarPassage books has created a need for far greater levels of research than any of my previous efforts. Not only do I have to get the current time scenes and chapters correct which can include physical therapy, locations and attitudes, I need to do the same with a half dozen historical settings and the real historical people involved. It is therefore tricky to describe research on my new book without spoiling the surprises and the flow of the story. 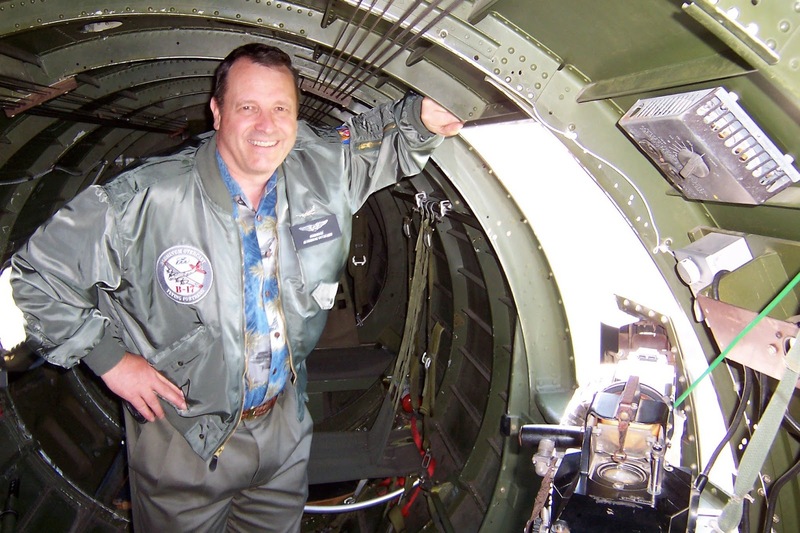 (Slight spoilers) My research this time covered a WWII B-17 bombing mission over Europe, a medieval group of first responders as their town is besieged by the Black Plague, an ancient middle eastern lost tomb, an iconic British colonial 18th century tragedy and a desperate moment during a key Civil War battle where history was changed by the right people in the right place taking decisive action. These and other chance meetings provide a diverse and unexpected series of passages for readers to enjoy. The cool part is that they flow together to weave lessons and help our heroes put the puzzles together in their own lives. Any reader that joins us will have a great ride but also learn a lot about themselves. Writing about so many different times and places requires extensive and varied research. That is part of the fun of discovery for me. History often turns on the most simple and seemingly insignificant moments or decisions. We see that at every turn in Book Three. My wife and I have a joint non-fiction book that will be coming out next year. We have had a blended family of ten children for over 13 years. This has been both a great challenge and a wonderful blessing. We believe what we have learned can critical to others who walk the same blended path. There is a dearth of literature on the subject and a lot of misdirection and avoidance of the subject in social discussion. We decided that it would be a great opportunity to share our experiences and more importantly the keys we have learned to successful blending. The book is titled: Living in the Family Blender: 10 Principles of a Successful Blended Family. 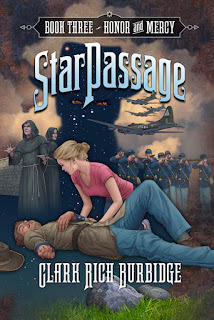 I am also working on the first stages of StarPassage Book Four. That is sufficient for the next two years at least. What are some of your all-time favorite books? An Angel in the Whirlwind about the life of George Washington should be on everyone’s reading list. Benson Bobrick expertly transports us to the colonial era and demonstrates that if we do not waste our energy on political correctness and more carefully study the great man that had the opportunity to become king of America and turned it down maybe there is something we can learn. America is the only country that was formed by revolution that did not immediately morph into a dictatorship of some kind. One man, George Washington, was the reason. I am inspired by individuals who do the right thing just because it is the right thing to do such as the character Sydney Carton in A Tale of Two Cities. The story of Scrooge’s redemption and his ability and courage to change is powerful as written by Dickens in A Christmas Carol. The Lord of the Rings and The Hobbit have always been my favorites since I discovered them one Christmas morning at the age of 21. Tolkein knew how to get the reader to turn the page and fill each one with wondrous characters and a real story that pulls the reader in. The Last Stand of Fox Company is a powerful look at a desperate effort by a small Company to keep a road open so that thousands of Marines could survive during the retreat from Chosin Resevoir in Korea. Band of Brothers and many of the other stories about the 101st and 82nd Airborne’s contribution during World War II describe the unit and personal level responses and courage of regular people in unimaginable situations. Treasure and almost any other book by Clive Cussler. He has a great formula and never fails to satisfy when I need a dose of pure fictional adventure. Dunkirk The real story of how the British Army was saved should be required reading for every student. It was an impossible feat accomplished on the spur of the moment through shear grit, courage and leadership. Killer Angels Michael Shaara’s riveting story of the battle of Gettysburg. And other books by his son Jeff give us insight into the personal experiences, mistakes and miracles of these iconic moments in history. The Screwtape Letters by CS Lewis. Every young person that doubts the power of faith and the existence of God should read this. Chronicles of Narnia are also a wonderful read. I have not included the Scriptures here but they are my daily study guide and inspiration. They cannot be on any list because they are in a class of their own. I love cycling, swimming, traveling and discovering the beautiful world around us. Whether it is in the haunted forest behind our home or on some far flung beach or mountain I find magic lurking everywhere. I ride between 60 and 110 miles per week. Working in the yard is also enjoyable. But most of all I love participating in life with my wife, our children and our community. It was a pleasure to share with you my thoughts in response to your well developed questions.